A new economical model in a single container, to shape the common knowledge. It answers to the basic human needs using digital construction techinques. 3D printer which allows to print houses and vertical plantation gardens. It is completed with other useful instruments to produce building material. The motor hoeing-machine is one of the first low cost tools used in agricolture, useful also for the plantation. It’s the ideal instrument to melt straw and clay. The mixture is put in the mixer to ultimate the working process. Using the local materials (terrain, straw, stones, vegetal fibres, etc.) we create the different mixtures. According to the used mixture you may build houses, vertical plantation systems, masterpieces, constructions useful to the community etc. A pump, working thanks to an engine, will gently push the moixture prepared from the mixer to the extrusion system. The outdated constructions, the ruins, the stones,or pieces of plaster etc. can be reduced in re usable materials for the 3D printer. One more interesting and of high technology sperimentation at low environmental impact, is the one which uses geopolymers mixed together with clay. Last updates on this research will be shortly divulgated. Please notice that the use of geopolymers reduces of 80% the environmental impact compared to other cement materials. The last innovation in WASP: a printer to self-produce furniture componenets, composed by 3 different Tools. It allows to print rough polymeric materials like pellets. This opens the way to a new idea of eco-friendly production. It is useful for the self-production of objects like: chairs, tables, bycicles and motor vehicles, car frames, wind turbines, etc. The outdated tools are minced in very little pieces and re-used to shape new and more functional and better and better gadgets. It is used to create cement and straw gadgets. It can be used with geopolymers (materials for supportable architectures), straw and other natural materials mixture and recycled moistures, etc. It can be usedd to build some house parts, bathroom fixture, high temperature ovens, heaters, tanks vases etc. The same 3D printer can be used to set down plastic polymers or geopolymers; it can be used also as cutting system, simply replacing the nozzle with a high speed-electrical arbor and with a plasma cut system. To print from the macroscopic to micorscopic with the same machine. With Delta 40 70 it is possible to realize a real production. With this printer you can create lighting products also made of porcelain and ceramics, scenery, objects and dishes. A flush high-speed 3D printer is a precision machine to produce objects in ABS, PLA, Nylon, Polyester, polyuretanic rubbers, etc. Allows to build smaller and more precise objects. To produce ceramic tools of advanced or traditional structure. We can supply a Kit able to transform the printer in a flush ceramic printer. Small size oven used to cook ceramic material produced . It can be used also for microfusion. for machinary maintenance, it includes: compressor , welding apparatus, grinding equipment, keys and tools, micro-lathe, screws and bolts for several materials. A GPL or biogas power unit : the evolution for the power unit systems is a “working in progress”. All what you need to know to build the Maker Economy is backed up in a SD card periodically updated. Each starter Kit will be supplied with connection; but using te SD card, it could also work indipendently. The Starter Kit is born to build residences using local material, natural recycled or standard building material too. Thanks to this technology all gathered Knowledge can be reproduced several times and spread everywhere through the web. The necessary Knowledge to set up the Starter Kit will be freely supplied on line, using some tutorials which drive the users in the realization of their ideas. The house project together with its contents is open source and allows project-managers, designers, engineers, architects, to enter the web-site and take or exchange contents. An active home that does not consume resources but generates it, with cost tending to zero, freeing man from debt. 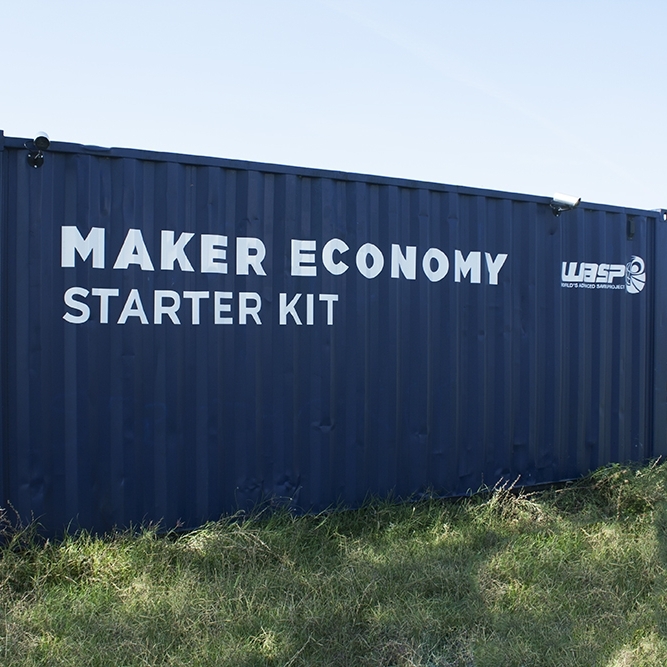 The Maker Economy Starter Kit was born for an economy of self-production, implantable everywhere. Digital fabrication is the process chosen because thanks to these technologies the project can be replicated and shared everywhere. The kit includes all the models of the Delta WASP line: from the Crane WASP, the 3D printer able to build houses, to the Delta WASP 3MT, multitools printer for the realization of furnishing products, vertical vegetable gardens, medium-sized elements as well as other digital manufacturing means produced by WASP to produce smaller-sized objects. In addition to the printers there are: cutting systems, systems for extrusion materials, feeding systems, material recycling systems, for crushing and recycling plastics or rubble. House, Art and Culture, Energy, Digital Fabrication, Health and Food are the themes that we are developing in the form of concrete projects with our 3D Printers.